I feel like an elephant is sitting on my chest. It really pisses me off. Clover deserves to hike Runyon and run free through the flowers. Instead I’m going to have to force myself out of bed and take Riggins and her to the dog park. Not nearly as much fun for any of us. I’ve missed my last two days of Bar Method class and today isn’t looking great. I despise being sick. I blame the crazy weather flux in LA this past week. Thursday it was shorts and tank tops hot. Monday it was pouring rain. 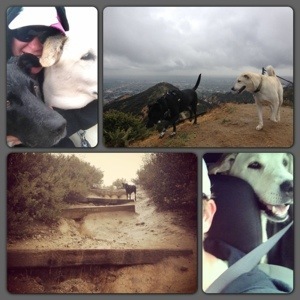 I suppose it didn’t help that I took the dogs to Runyon Monday morning rain be damned. You know what Clover likes more than being wet? Being wet and muddy. She was so happy! I hope I feel better tomorrow so Clover can have more Runyon days before she goes home.